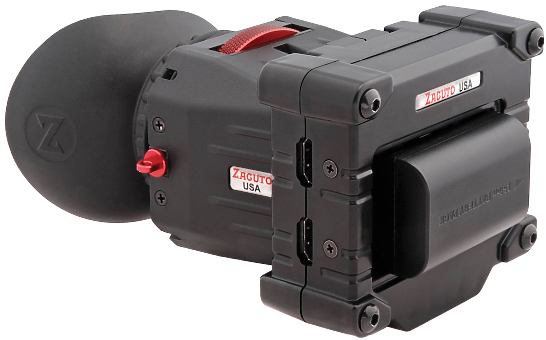 The Zacuto Z-Finder EVF Pro (3.2”) is an electronic view finder with a TFT LCD display and offers a resolution of 800 x 480 and 16.7M color. Consisting of an EVF Flip model and an optical viewfinder, the EVF Pro allows you to operate a DSLR or any other camera with an HDMI port, by offering an image as seen by the camera itself. Designed to be attached ‘in-line’ to your rod system, it aids in stable and efficient shooting, and ensures correct form factor for the video. The EVF can be used with all Z-Finder models and is compatible with virtually all cameras with an HDMI output, including the Canon C100/C300/C500, Sony FS100, Sony F3, Scarlet, Red One & Epic, Panasonic AG-AF100.. The battery level indicator with selectable on/off display icon appears automatically when the battery power reaches 10% remaining. You can update your EVF firmware via a USB port. 3 assignable function buttons allow you to program up to 3 functions. Using Live Menu Preview, you can view changes during menu changes.